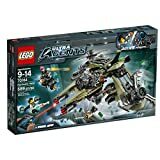 Lego Ultra Agents Hurricane Heist 70164 - N.I.B. This is a New LEGO 70164 Ultra Agents - Hurricane Heist. This box has a slight grip mark in the lower right corner of front and a price sticker pull on the upper right corner of box(see images). It is sealed and in excellent condition aside from those points. We will package and ship in 1-2 business days. Our goal is to provide a great product and the best service. We have been selling for many years on other online markets and have 100% Feedback. Thank you for looking! We do require Payment in full within 2 days of purchase, and will process your order only after that payment is complete. We accept PayPal, and have been verified with them. We utilize FedEx, USPS, and UPS for our shipping. The package is always insured and tracking info. always provided. Your items will be shipped to you in a clean, and well protected package so it arrives to you in its original condition. We generally do not accept refunds for NEW sets, unless the shipping service used damaged it and an insurance claim ensues. Our goal is to provide the best experience for our customers and always deliver the best customer service. On used sets or parts we offer, we will accept returns for full refund of item cost. The item must be returned in 14 days of original delivery to qualify. The cost of shipping will be the buyers responsibility. The refund will be processed immediately upon receiving the item in return.